Most days, I don’t come close enough to my 5-7 servings of fruits & veggies. But I know for a fact that I get 2-3. 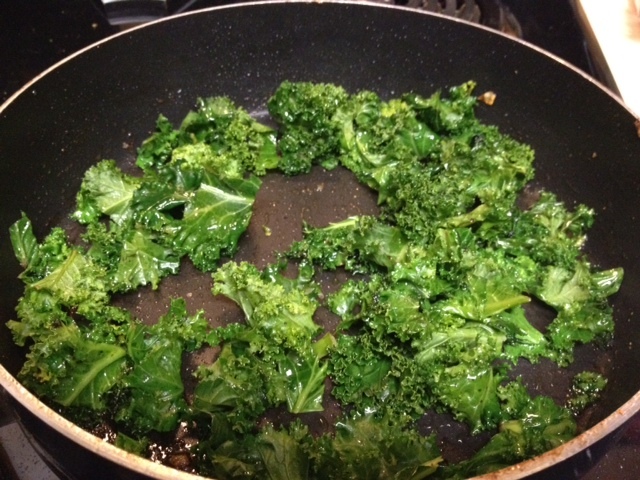 And that’s through sauteed kale. I have a sickness, I love kale so much. I have literally had it 6 days a week for…months? And the great thing is it’s literally a 5-10 minute dish. 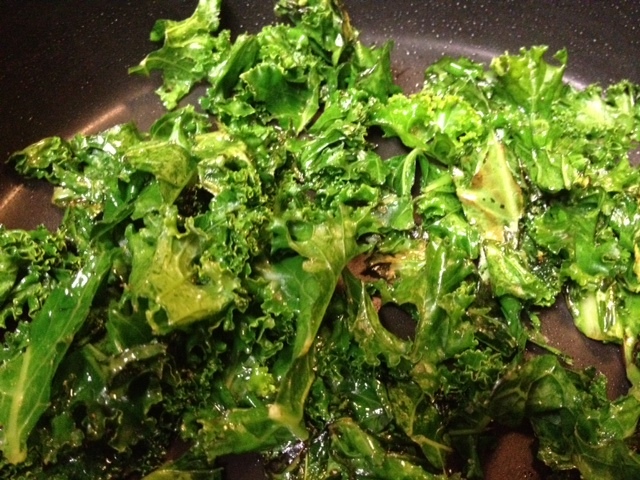 So buy yourself a big bag of chopped/torn kale (like $2.99 at the grocery store) or big leafy stems of kale (usually about $1.99 a bunch), and get started! Heat a couple tablespoons of olive oil in a skillet on medium high. Make sure that the kale leaves aren’t wet—if they are, pat them dry with a paper towel, or you’ll end up with a soggy mess. 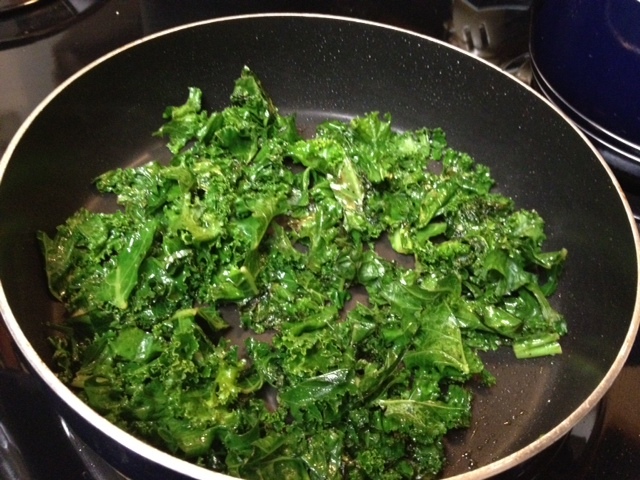 Add leafs of kale to the pan, as much as you want (remember it cooks down). You’ll probably want to remove all the bigger stems, they don’t taste as good as the leaves. Add some fresh-ground sea salt and pepper and a little bit of garlic powder. 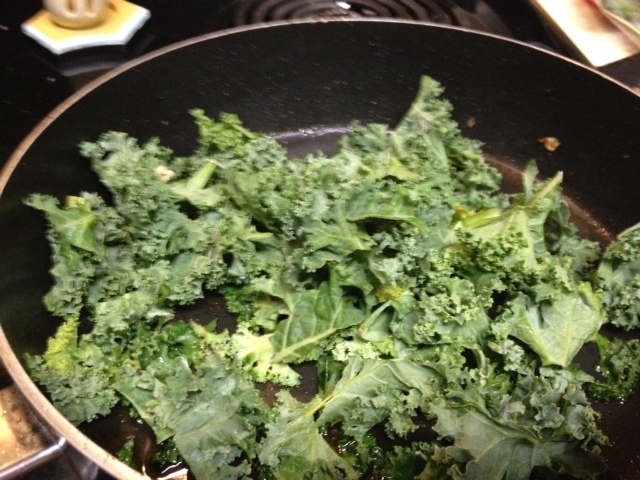 I recommend going easy on the salt while cooking, I always find the kale tastes a little salty when it’s cooked anyway. How long it cooks is up to you—I like mine pretty done, almost crispy as if it had been roasted in the oven, and that takes anywhere from 5 to 15 minutes depending on how full the pan is. But you might like it more like a “sauteed spinach” texture. You can play around with it, add shallots or scallions, minced garlic instead of powdered garlic, a tiny bit of brown sugar and walnuts for a caramelized version. Pretty much anything. Use it as a side or throw it in with pasta (like this delicious pasta with asparagus, lemon, goat cheese, & kale), on top of a pizza, in a casserole. Easiest thing in the world!